For the last few months, we've been raising an outcry against Encrypted Media Extensions (EME), a plan by Netflix and a block of other media and software companies to squeeze support for Digital Restrictions Management (DRM) into the HTML standard, the core language of the Worldwide Web. The HTML standard is set by the World Wide Web Consortium (W3C), which this block of corporations has been heavily lobbying as of late. The proposed adoption of EME is disturbing for what it says about the way decisions are made relative to the Web, but what does it mean for you as a free software user? DRM and free software don't mix. All DRM software relies on keeping secrets, like decryption algorithms, from the user, so that users cannot design their own method to modify it. The secrets are stored on users' own computers in places users cannot access or even read. This practice inherently tramples Freedom 1 of the Free Software Definition: the freedom to study how a program works and change it so it does your computing as you wish. This means that each time a part of the Web starts requiring DRM software to decrypt it, it becomes inaccessible to free software. And if influential companies like Netflix, Google and Microsoft succeed at jamming DRM into the HTML standard, there will be even more pressure than there already is for people distributing media to encumber it with DRM. We'll see an explosion of DRM on the Web -- a growing dark zone inaccessible to free software users. This threatens to happen at a time when the state of free software-friendly media on the Web was starting to improve, with the increasing quality of free video codecs and the decline of Flash accompanied by the rise of the HTML5 video tag. Netflix's lobbying in the W3C is paid for by subscription fees, so we're asking you to help pull that money out from under them by boycotting their services. If you have an account, use this link to cancel it. 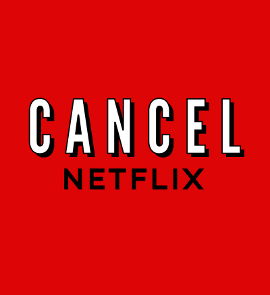 Whether you're canceling an account or not, you can help the boycott build momentum by spreading the word with the hashtag #CancelNetflix. This is about more than just movies and music on the Web. The adoption of EME would represent an enclosure of the free Web and the incremental erosion of users' freedom. What's at stake is not only whether you will be able to save and remix videos or music, but also whether your web browser and operating system can be free and continue to experience the same Web as everyone else. Microsoft has already modified Internet Explorer to start supporting EME for media streaming. Simultaneously, Netflix has begun publicly promoting Internet Explorer, revealing a two-pronged strategy of pushing proprietary browsers while attacking Web standards in the W3C. If they succeed at passing EME, pressure will be put on browsers (including the free browsers we use to surf the Web) to support this corrupt new standard. Showing opposition to EME now is a good way to demonstrate that, if it comes to this, we will stand with the free browsers in favor of their ideals. Mark Watson, an engineer from Netflix, is spearheading the effort to pass EME in the W3C, using his company's economic power to influence the consortium. The FSF and our allies have been fighting back by organizing free software users and the anti-DRM movement against the EME proposal. More than 22,000 people signed our petition demanding W3C drop EME, which we delivered in person to the W3C in May. We have accounts that we've gotten through to many of the people that are involved with the W3C -- people who care about the Web understand that EME is a terrible idea. But the W3C's leadership, including its CEO Jeff Jaffe, are supportive of Netflix and its block. This became apparent when our friends at the Electronic Frontier Foundation filed a formal objection to EME within the W3C's official process, and Jaffe reacted by trying to shove it aside and steam ahead with ratifying the proposal. This is the time to push hard on the W3C and Netflix, and demonstrate that we refuse to choose between accessing the Internet and having freedom as software users. Please join us: revoke your support for Netflix now and spread the word. Once you've canceled, how about donating those subscription funds to the Free Software Foundation or another group that is fighting on your behalf? We will use those dollars to amplify the impact of your cancellation.